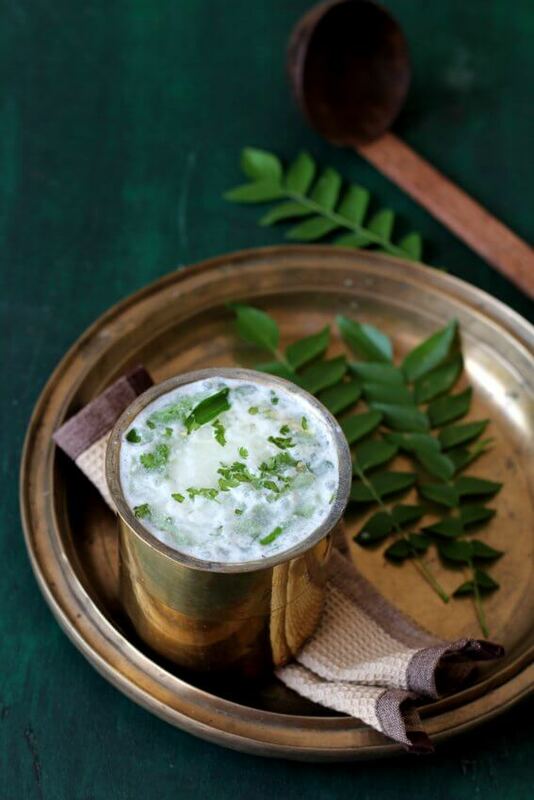 Neer mor or Neer moru is the Tamil name for South Indian buttermilk made with curd or yogurt. 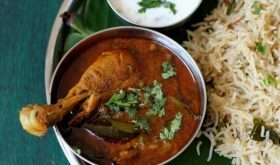 It goes by the name majjiga in Telugu, majjige in Kannada and sambaram in Malayalam. 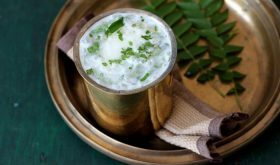 It is a refreshing, cooling, traditional, yogurt-based drink that’s perfect for the sweltering heat during the summer months. 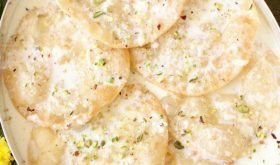 It is similar to lassi, sweetened yogurt drink but savory in flavor with a high proportion of water to yogurt like chaas or mattha. In many Indian homes, down South, you will find grandmothers and mothers filling earthen pots with neer mor during the summer months. Not only do the family members relish this easily digestible buttermilk beverage but also offer guests. 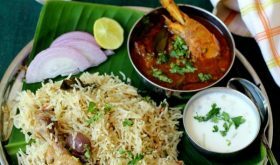 Neer mor is an integral part of a South Indian thali and is savored towards the end of the meal since it aids digestion. Buttermilk has probiotic benefits, hydrates and gives relief from fatigue and profuse sweating. Neer mor, vadapappu panakam are offered to Lord Rama on the occasion of Sri Ram Navami festival. They are also prepared to celebrate the Tamil new year which falls on April 14th, 2016. I am maintaining an organic garden and grow curry leaf plant, green chilis, and fresh coriander among other plants. Its a pleasure to pluck fresh herbs and use them in my cooking especially while making spiced buttermilk. During summer, I make a batch of fresh neer mor every day. Each home has their own spice concoction, i.e the spices/herbs used in the making of spiced buttermilk recipe. 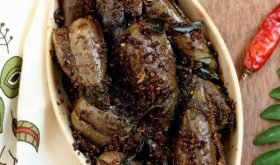 Some homecooks make a paste of green chilies and ginger while others add slit or chopped green chilies and grated ginger to neer mor. I like to add grated ginger and slit green chilis. After the neer mor is infused with the flavors, I discard the green chilis and serve. We should allow the neer mor to sit for a couple of minutes for the flavors to meld. 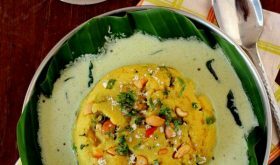 Another variation is the addition of a tempering of mustard seeds, asafoetida and curry leaves to the neer mor or majjiga. 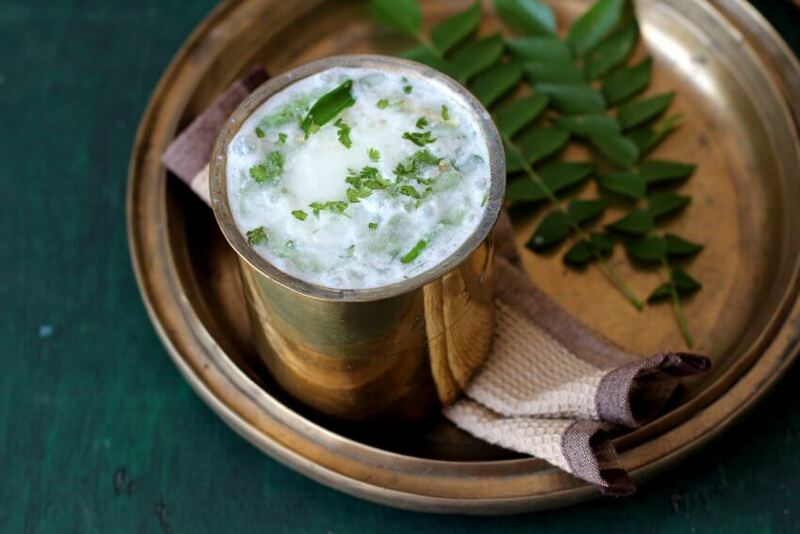 Use fresh, well set thick curd and fresh herbs to savor the true flavor of neer more. 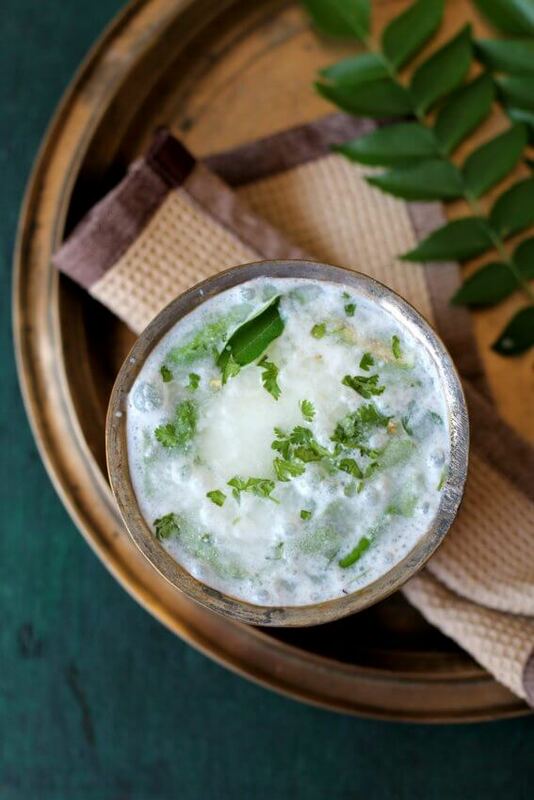 One of the best Indian summer drinks that is healthy, refreshing and tasty. In a large bowl, add the fresh, well set thick curd or yogurt and beat with a spoon or whisk till smooth with no lumps. Beat for at least 2 mins. Add 3 to 4 cups chilled water and use a churner to churn till frothy. If you don't have a churner, use a hand blender, whisk or spoon. Add asafoetida, green chilies, ginger, coriander leaves, and curry leaves and mix well. At the time of serving, discard the slit green chilies and pour the neer mor into serving glasses and serve. Use fresh, well set, thick curd. You can add ginger-green chili paste. You can add a dash of lemon juice if the buttermilk isn't sour. Very delicious and nutritious drink and is perfect for summer season to get relief from hotness. Tried it today at home…Tasted great…Thankss for the recipe !!! We simply enjoy mor at home during summers with lunch.